A US study has revealed that blue-eyed horses are no more likely to suffer from ocular disease than their brown-eyed counterparts. But the researchers from the universities of Illinois and Georgia did learn that horses with blue or heterochromic irises (where there is a difference of colour in the iris) were more likely to develop ocular squamous cell carcinoma (SCC) than horses with brown irises. The retrospective study looked at the medical records of horses presenting to either the Comparative Ophthalmology services or Equine Medicine/Surgery services at the University of Illinois and the University of Georgia. Signalment, ocular and nonocular diagnoses were recorded. Ocular disease was divided into four categories: adnexa, cornea, intraocular/orbit and squamous cell carcinoma (SCC). Chi-square analysis was used to compare group proportions. A total of 164 eyes of horses with ocular disease and 212 eyes of horses without ocular disease were included. Blue eyes were equally common in the ocular disease and nonocular disease groups (P = 0.265). 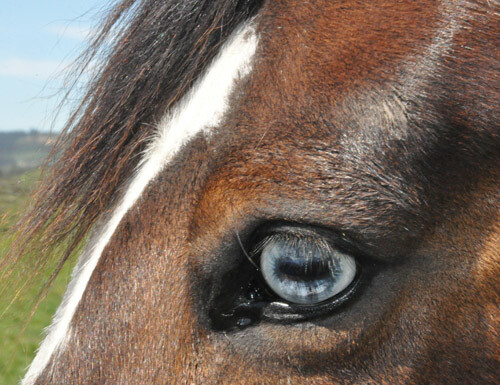 There was no significant difference in the proportion of blue and brown-eyed horses when comparing the adnexal and corneal (P = 0.548), corneal and intraocular/orbit (P = 0.379) and adnexal and intraocular/orbit (P = 0.843) categories. A significant difference was detected in the proportion of blue-eyed horses between the adnexal (P = 0.000), corneal (P = 0.033), intraocular/orbital (P = 0.000) and SCC categories, with a higher proportion of blue-eyed horses in the SCC than in the other three groups. Horses with blue or heterochromic irides are more likely to develop ocular SCC than horses with brown irides, but are not more likely to have adnexal, corneal or intraocular/orbital disease or to be presented for evaluation of ophthalmic disease.